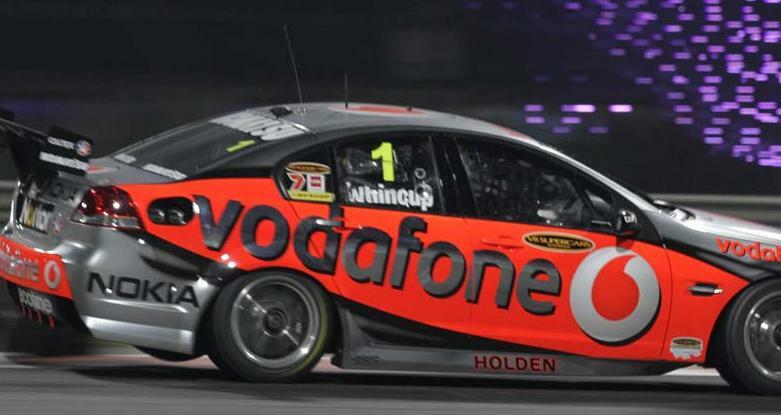 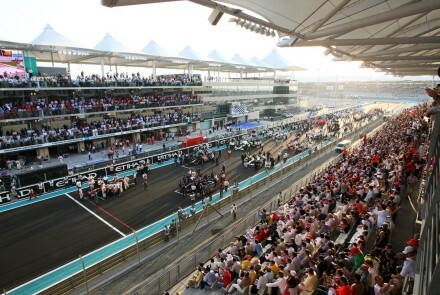 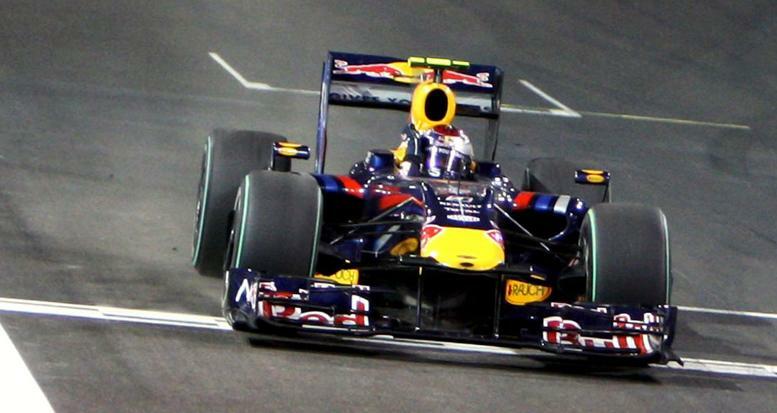 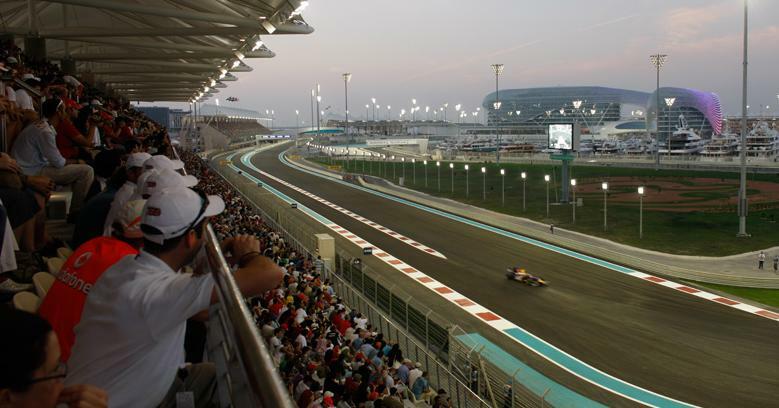 The Abu Dhabi Grand Prix was announced in early 2007 at the Abu Dhabi F1 Festival, and the first Formula 1 race – the Etihad Airways Abu Dhabi Grand Prix – took place on November 1st, 2009. 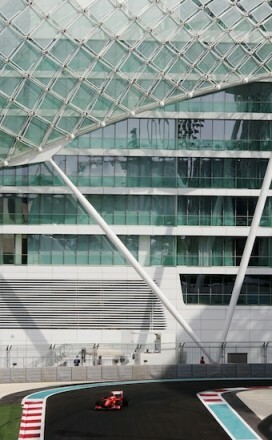 The Yas Marina Circuit was designed by Hermann Tilke. 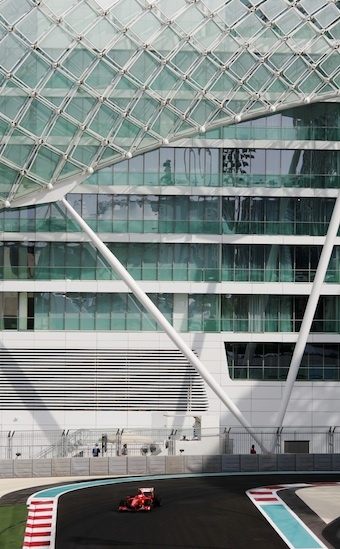 The track features a Monaco-style harbour front section using public roads, and another section similar to the Eau Rouge corner of the Spa-Francorchamps circuit. 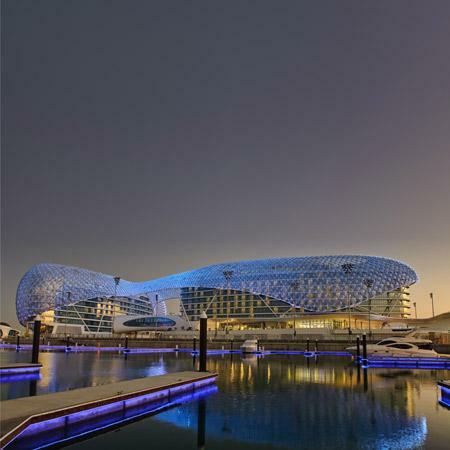 Kreon proudly supplied products as selected by Klein Associates Interior Architects and Tilke Architects to illuminate all major buildings of Yas Marina Formula 1 circuit, Abu Dhabi. 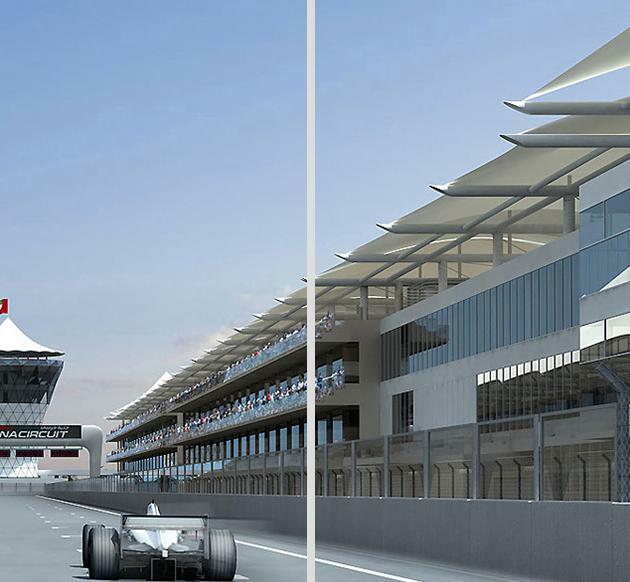 Pressroom, team buildings, public spaces are designed to reflect a successful symbiosis between the high-tech environment of the race circuit and traditional mashrabia culture. 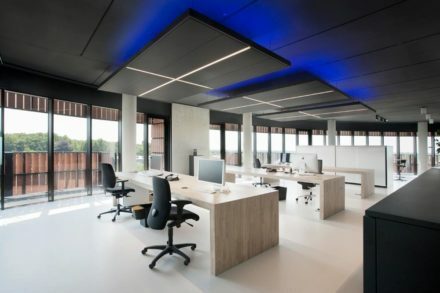 Right down to the lighting, Klein Associates Interior Architects has designed the atmosphere for these rooms based on design drivers like “contrast of dark and bright”, “respect for traditional elements”, etc. 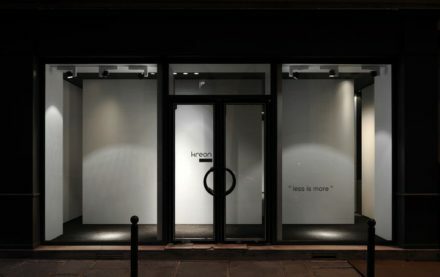 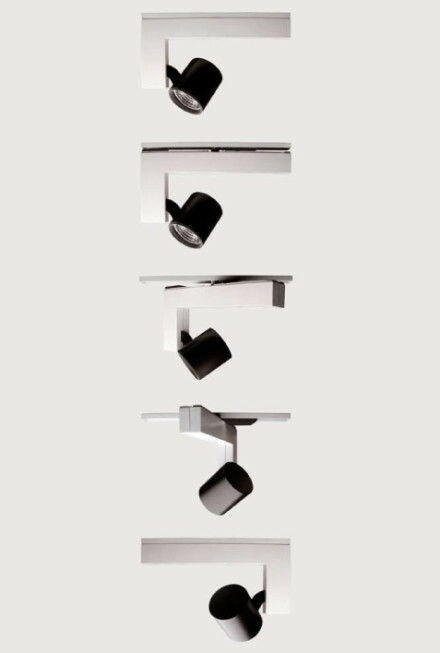 With recessed lightsource, balanced visual comfort and minimal decoration, Kreon products proved the perfect solution. 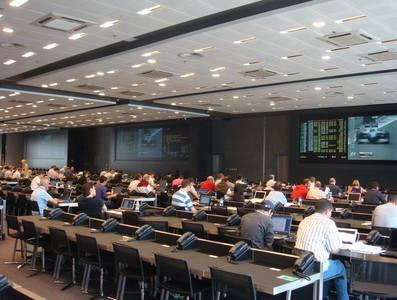 From the very bright entrance hall you enter the dark atmosphere of the media center. 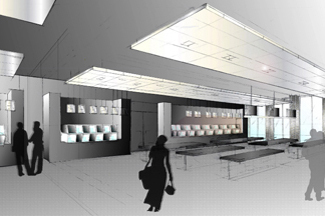 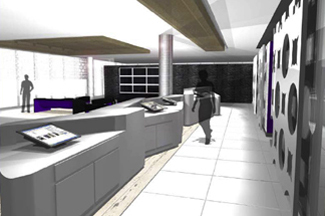 The first floor information desks are lit by integrated luminaires in white vektron ceilings and hanging kwadro vertical luminaires. 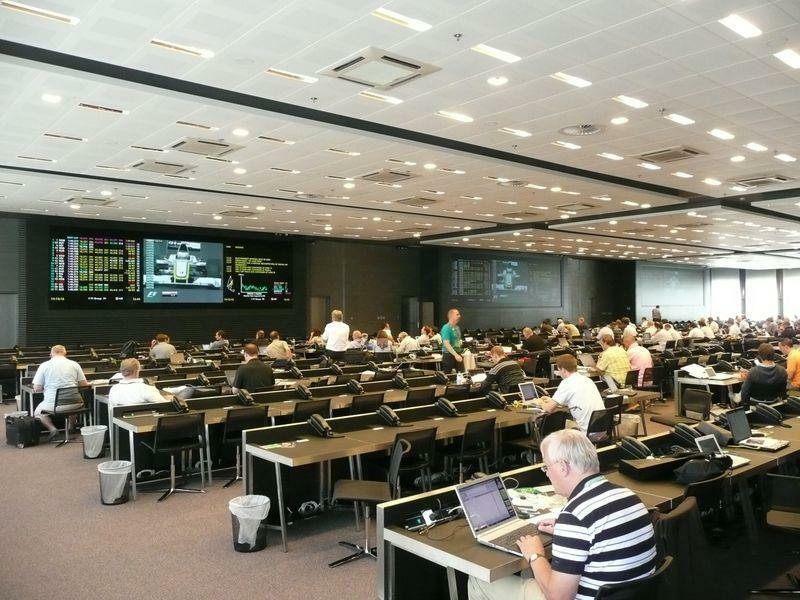 In the press room, the glossy surface of the structured black wallpaper is standing next to the black vektron panels with integrated light on wall and ceiling. 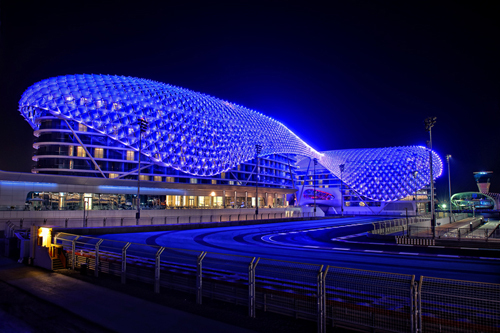 The entrance, roofed with a cupola, is cladded with glass mosaic and accentuated by colored light, which can be adapted to the color the racing team. 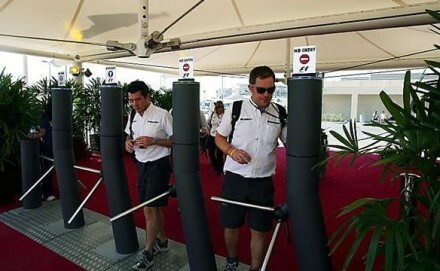 From there you enter the catering guest or catering team area. 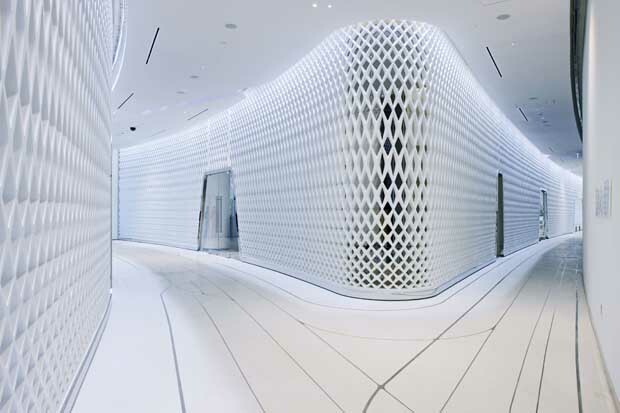 The space is designed as a bright, white monochrome cover. 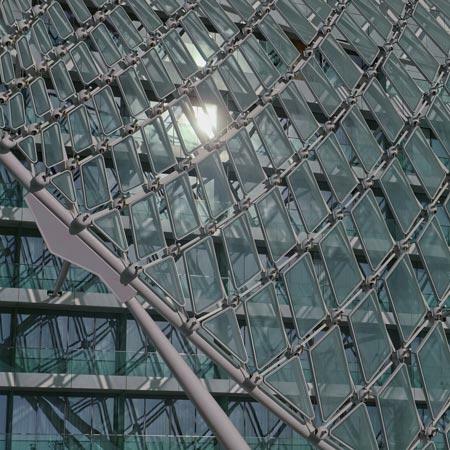 The sunscreens (on three sides) are printed with a abstract mashrabia pattern. 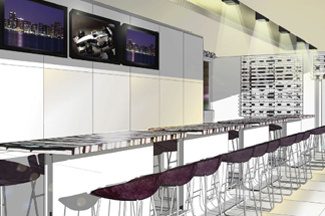 To support the communicative aspect, team members have their meals at an extra-long, high table. 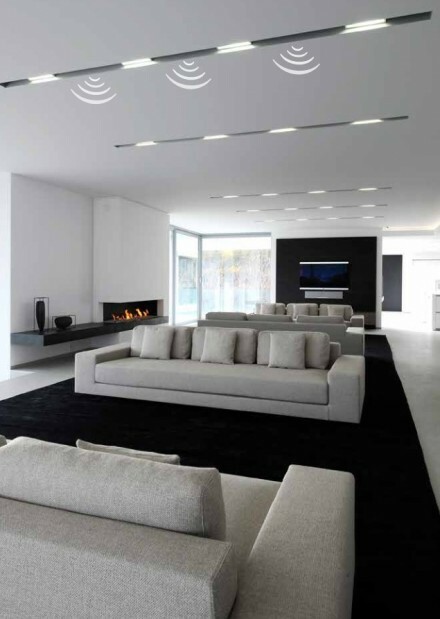 Above it, the ceiling is recessed, and equipped with kreon regard double and mini down luminaries. 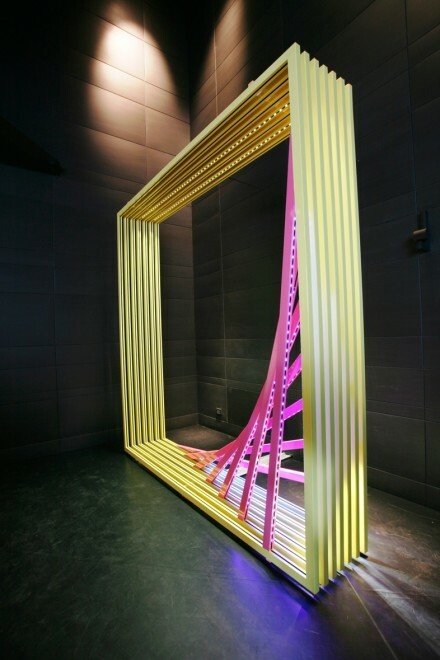 Converted mashrabia design encloses the room in form of printed sunscreen elements. 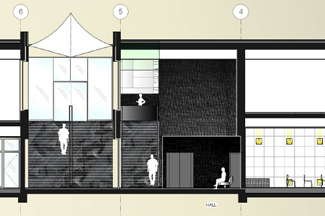 A freestanding cube forms the back of the reception, looking like arranged, oversized stone elements. 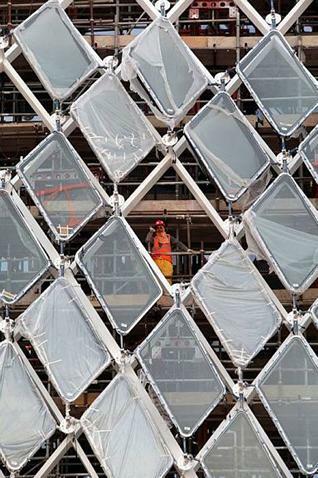 The cube panels irritate with the partly translucent, partly reflective in form of oversize mashrabia cuts. 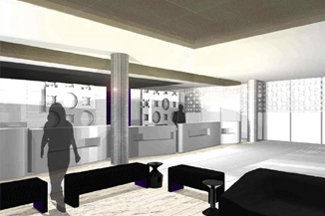 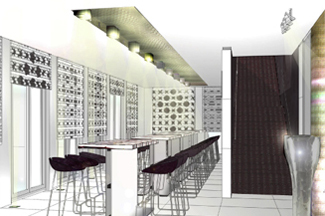 The boundery to the non public area is designed with structured, black leather wall panels. 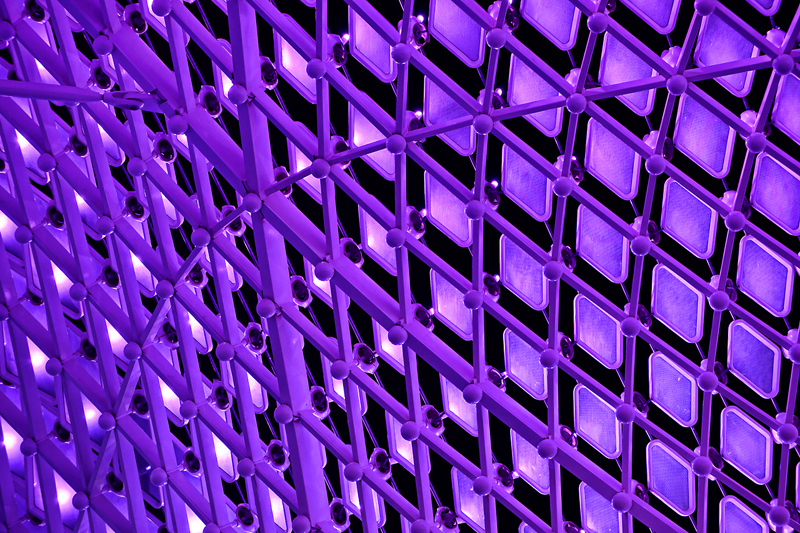 Above the reception and lounge area a suspended metal lighting cube with inside hidden Kreon diapasons lighting accents. 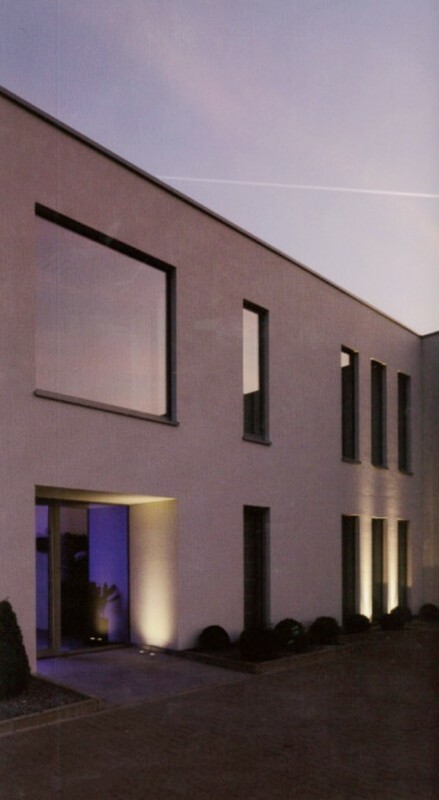 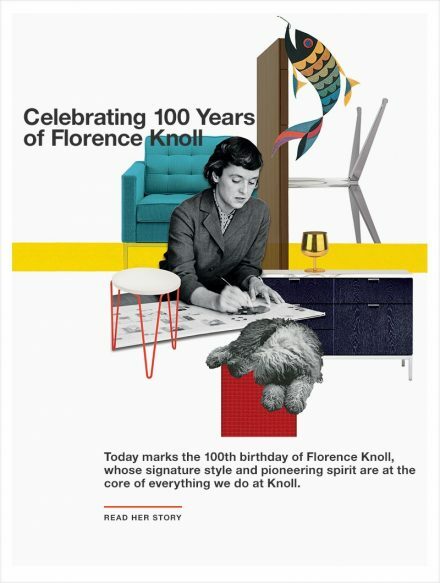 These products reflect the technical aspect of the project and emphasize the intercultural atmosphere. 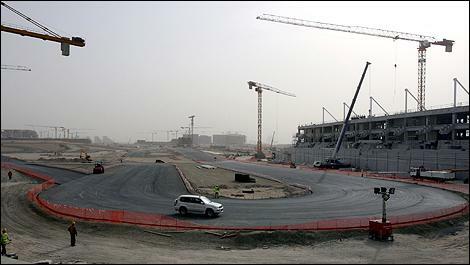 Right next door is the iconic Yas Hotel, a luxury marina, yacht club, six other hotels, the Yas Island golf links and the Ferrari World indoor theme park, set to open in late 2010. 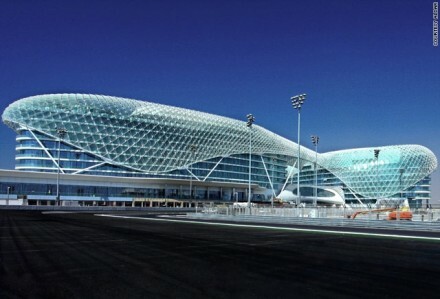 The international airport is close by and only 25 minutes away is the thriving city of Abu Dhabi, the capital of the UAE, largest of the seven Emirates and one of the fastest-growing tourism destinations in the world. 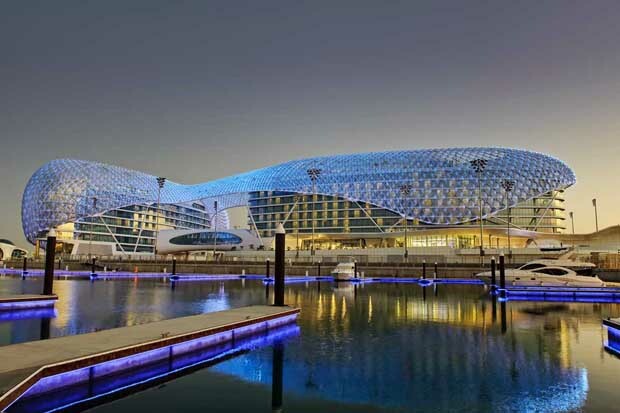 Yas Island will become a premium attraction for all visitors to Abu Dhabi, with a Ferrari theme park, a water park, golf courses, marinas and numerous retail and dining outlets. 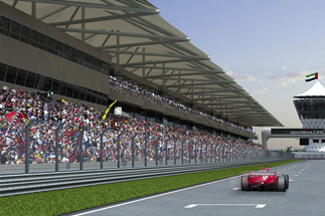 The island will also feature the only Ferrari driving school in the world outside the Maranello base. 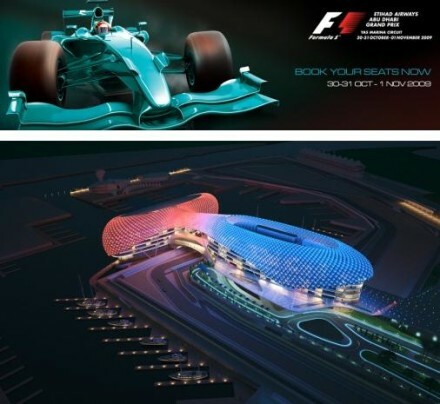 Tilke Engineers & Architects, originally established in 1983, is recognised as the world leading designer for racetrack and test facilities. 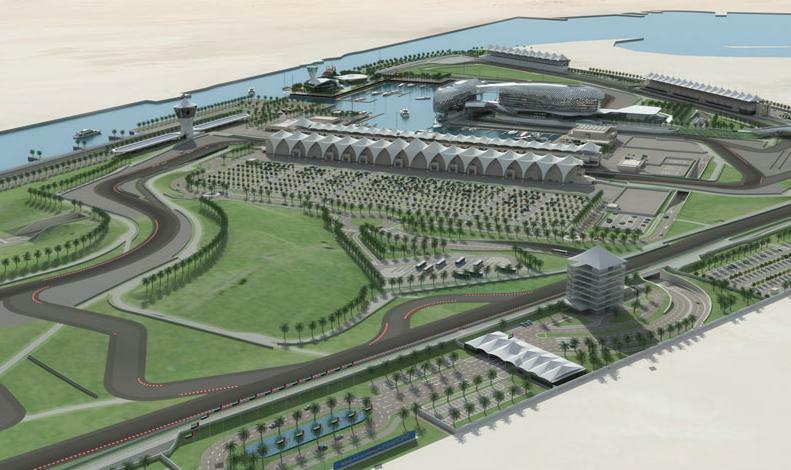 Tilke aims to design individual and state-of-the-art race tracks including grandstands, pit buildings, team buildings and other infrastructure facilities by fulfilling their clients needs and the permanently changing requirements on track-layout and safety. 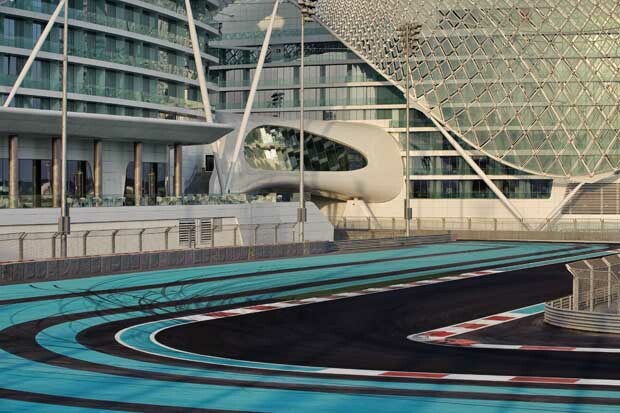 A unique balance between these requirements, an enormous engineering experience and competence as well as Hermann Tilke´s individual racing driver career, makes the company a reliable and most valuable planning partner in the field of track design. Besides developments directly relating to the automotive sector, Tilke is also involved in the design of hotels, administration buildings, housing projects, malls, and any sports and leisure facilities. 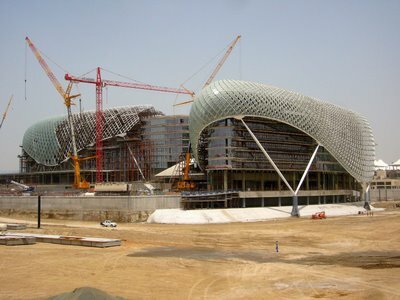 In order to supervise and complete the above mentioned projects professionally, the company provides a large interdisciplinary skilled team of more than 350 engineers and architects with offices in Germany, Bahrain, the United Arab Emirates, Singapore, Mexico, Kazakhstan, India and Azerbaijan. 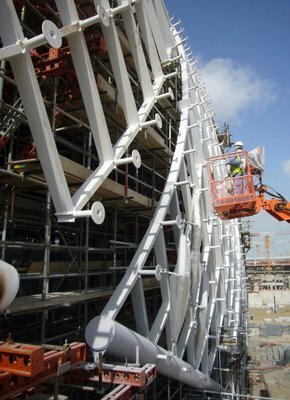 Tilke´s services include civil engineering, architecture as well as electromechanical engineering and electronic engineering from the first initial concept to detailed design, construction supervision and project management. 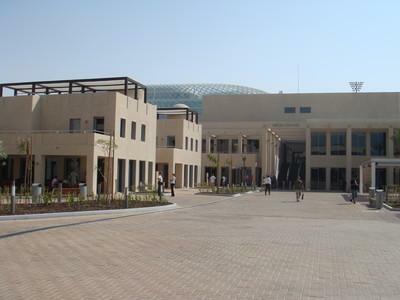 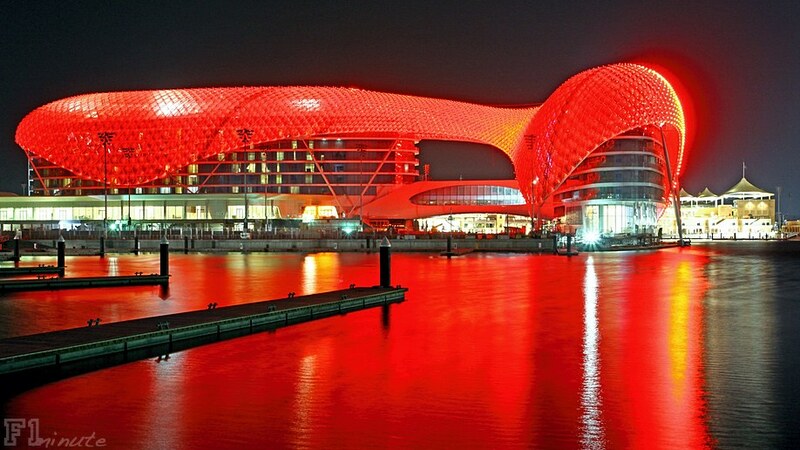 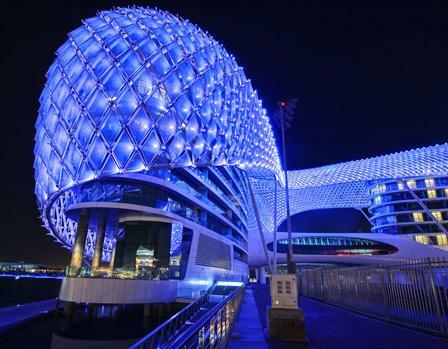 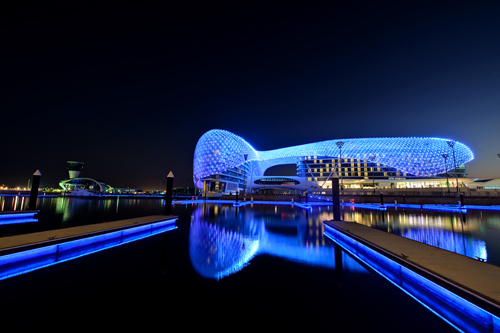 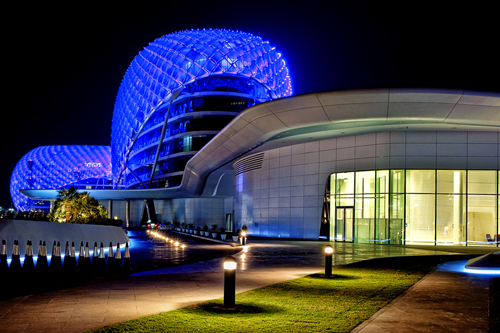 The Yas Marina Hotel is located within the Yas Marina Circuit, Abu Dhabi. 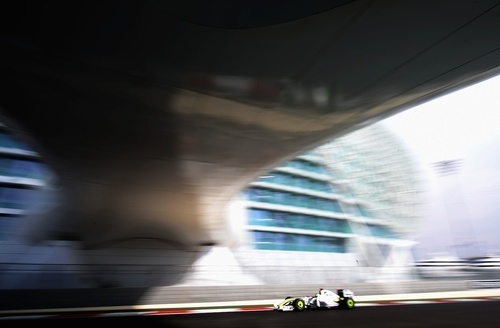 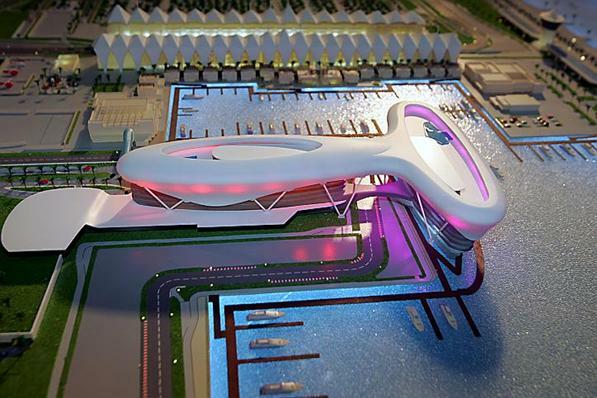 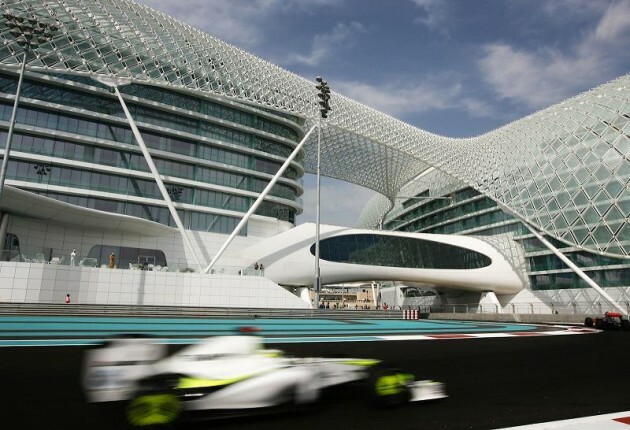 It is the first new hotel in the world to be built over an F1 race circuit. 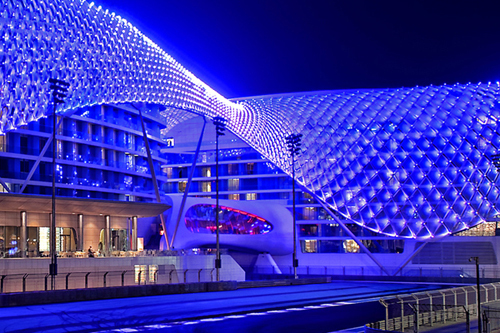 The hotel’s exterior surface is designed as an environmentally responsive skin that by day reflects the sky and surroundings and by night is lit by a full color changing LED lighting system that incorporate video feeds that are trasmited over the entire surface of the building. 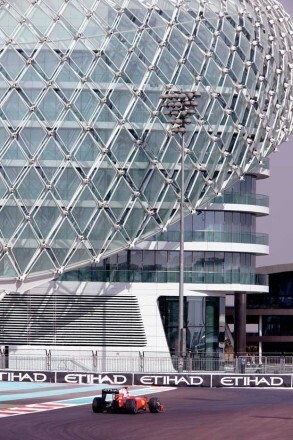 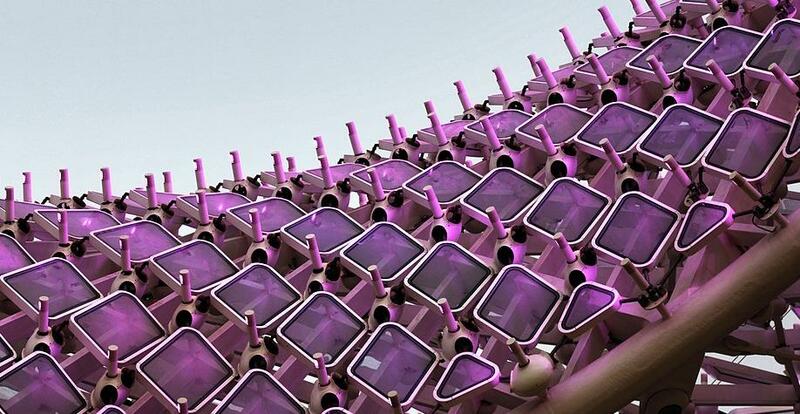 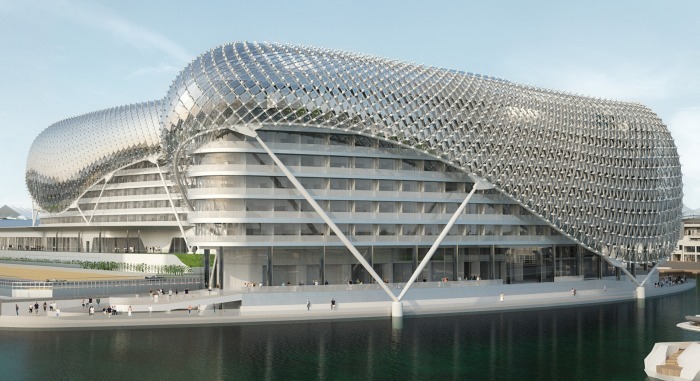 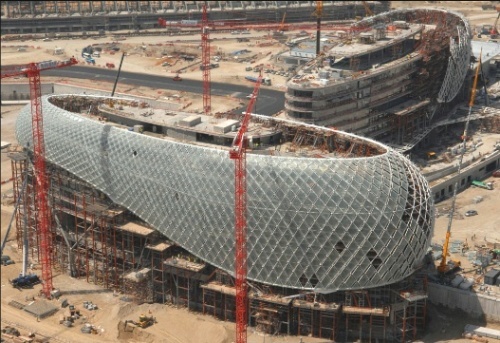 The Yas hotel, a 500-room, 85,000-square-meter structure made up of two twelve story hotel towers linked together by a monocoque steel and glass bridge A Grid Shell structure that both cross above and over the Yas Marina Circuit F1 race track. 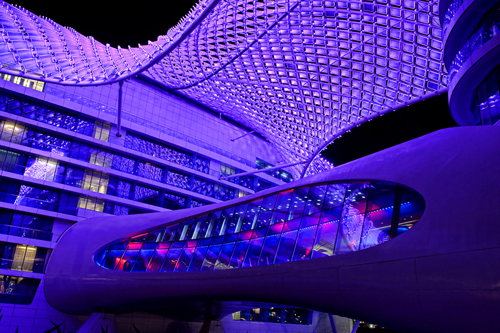 Asymptote created and conceived of the building as an architectural landmark embodying key influences and local and global inspirations ranging from the aesthetics and forms associated with speed and spectacle to the artistry and geometries that form the basis of ancient Islamic art and craft traditions. 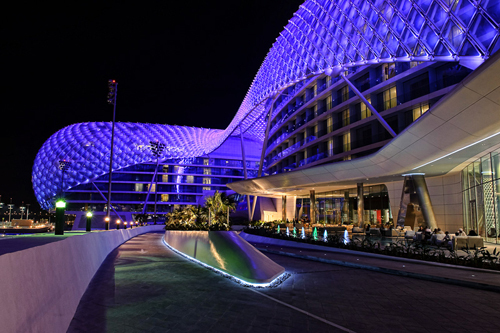 Of architectural and engineering significance is the main feature of the hotelʼs design; a 217-meter expanse of sweeping, curvilinear glass and steel covering that is made up of 5,800 pivoting diamond-shaped glass panels. 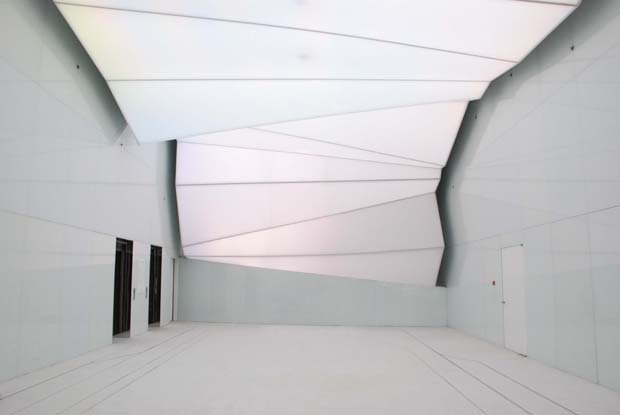 This Grid-Shell component is a key aspect of the overall architectural design and significance of the project by producing an atmospheric-like veil visible from miles away. 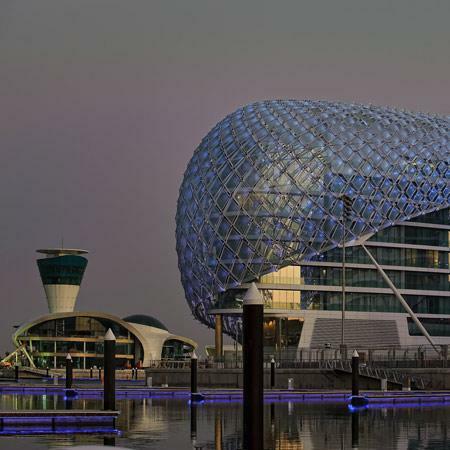 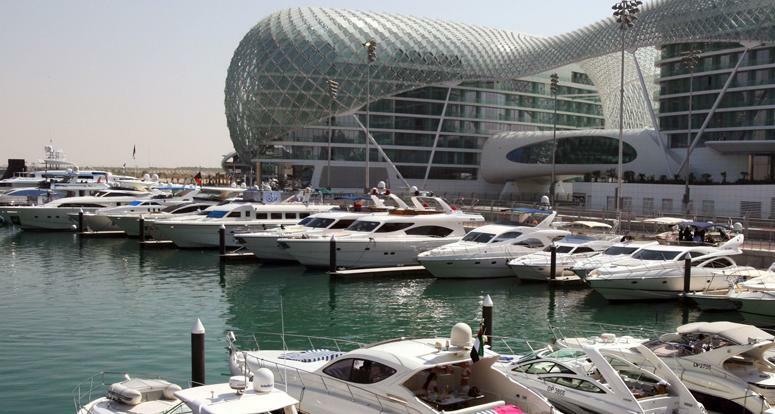 Feb.17 (Zawya Dow Jones) Aldar Properties, Abu Dhabi’s largest developer by market value, has sold the racing circuit, marina, yacht club as well as other infrastructure assets at its flagship Yas Marina development to the Abu Dhabi government, its chief financial officer said Sunday. 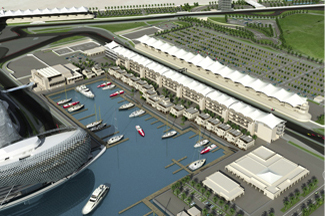 Aldar sold the Yas Marina “yacht club, a number of buildings on the race track, and the track,” as well as “a number of internal roads, sewerage, electricity,” to the government, as part of the emirate’s plan to beef up infrastructure and diversify the economy, Shafqat Malik told Zawya Dow Jones in an interview. 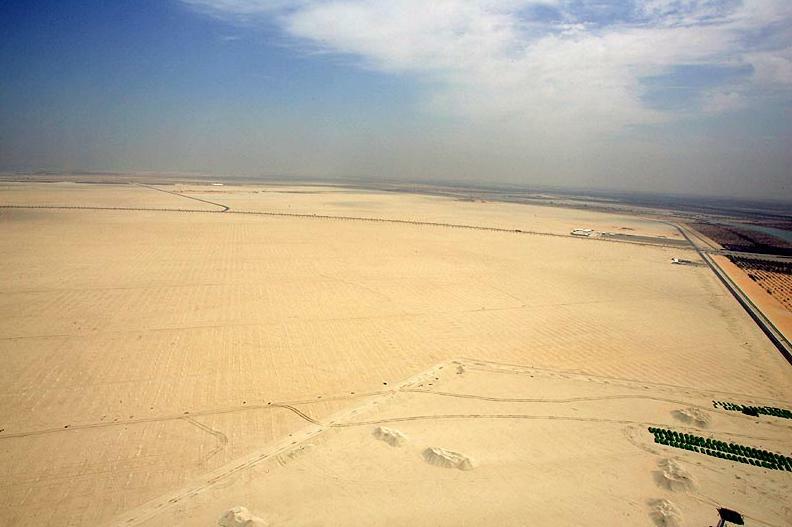 Analysts were closely watching the developer’s results release with expectations that it would sell the prized asset to free up cash, after its profit slumped throughout 2009 and land sales remained few. 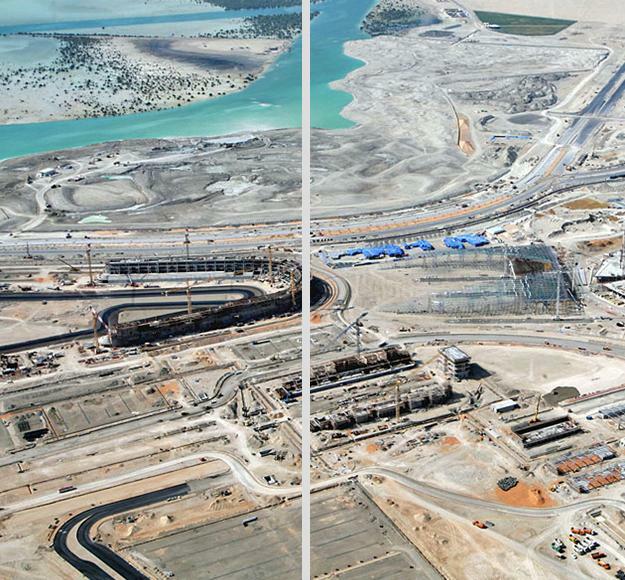 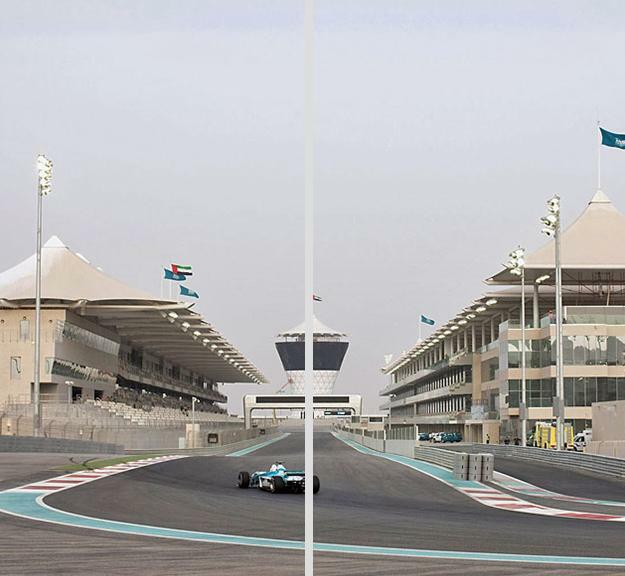 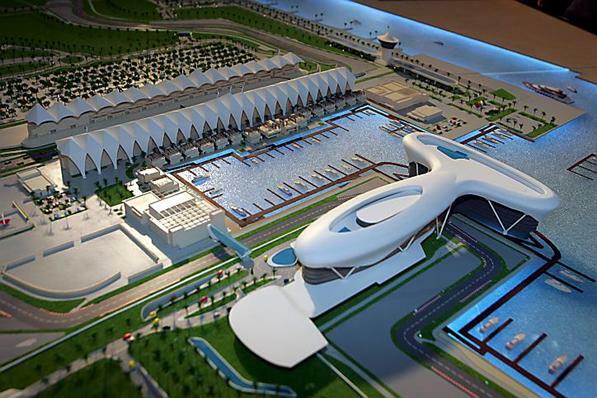 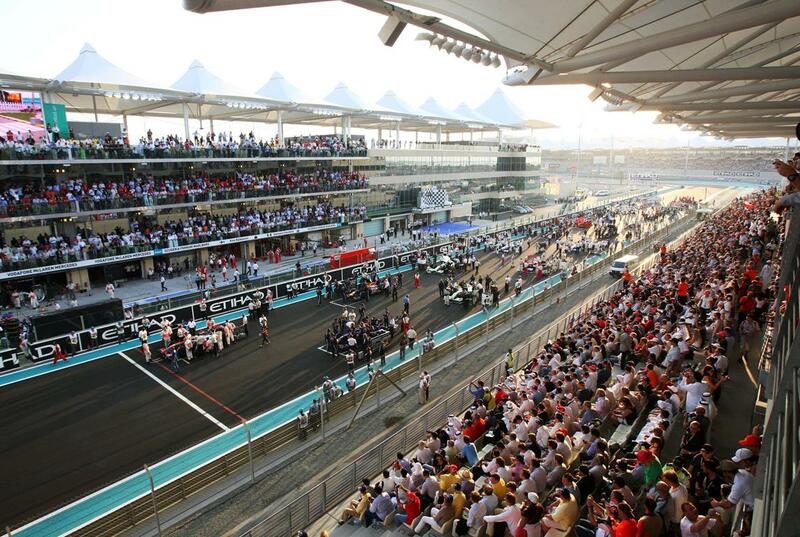 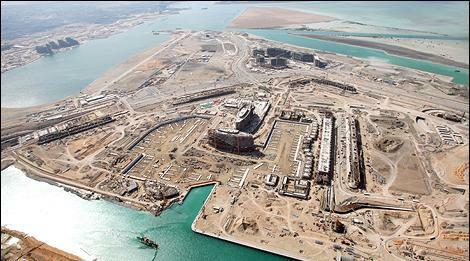 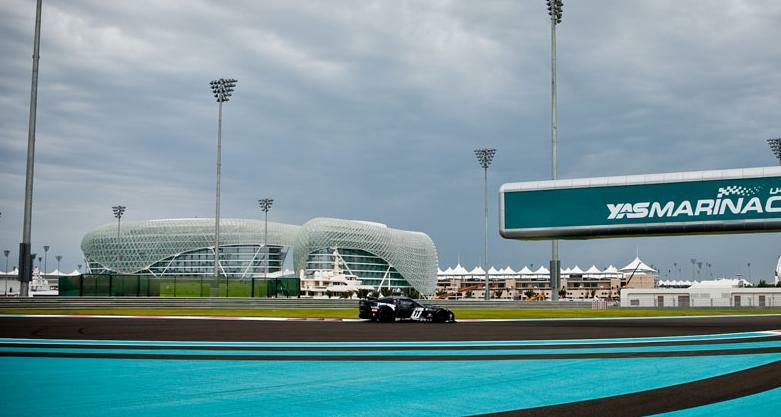 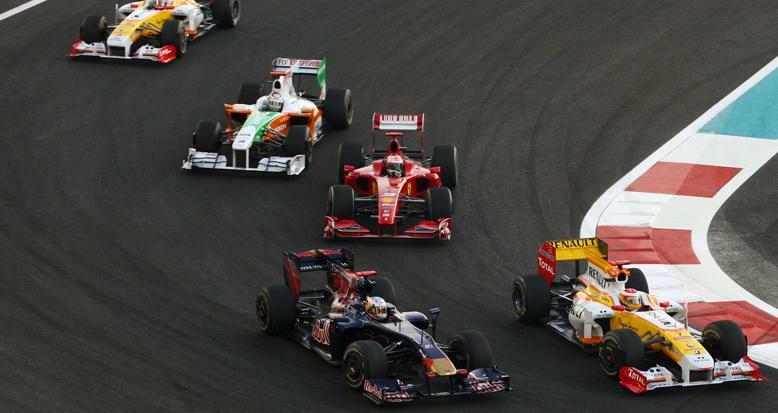 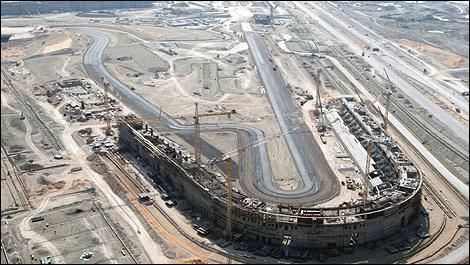 Aldar owns 40% of Yas Marina Circuit, which hosted the inaugural Abu Dhabi Formula One Grand Prix in November. 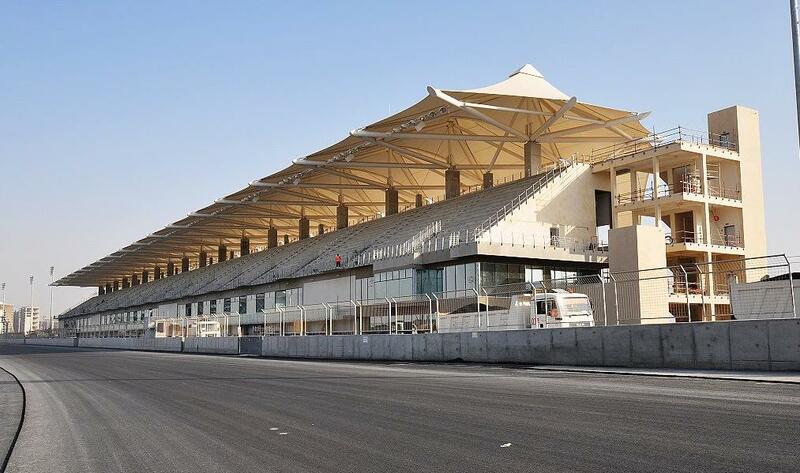 It operates the circuit and is estimated to have spent $400 million building the $1 billion track in a joint venture with government-owned Abu Dhabi Motorsports Management, or ADMM, which owns 60%. 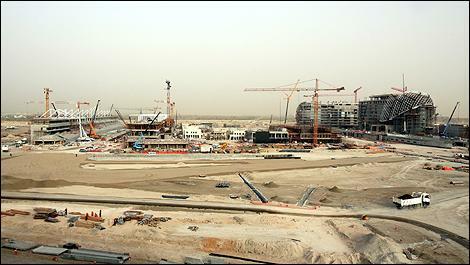 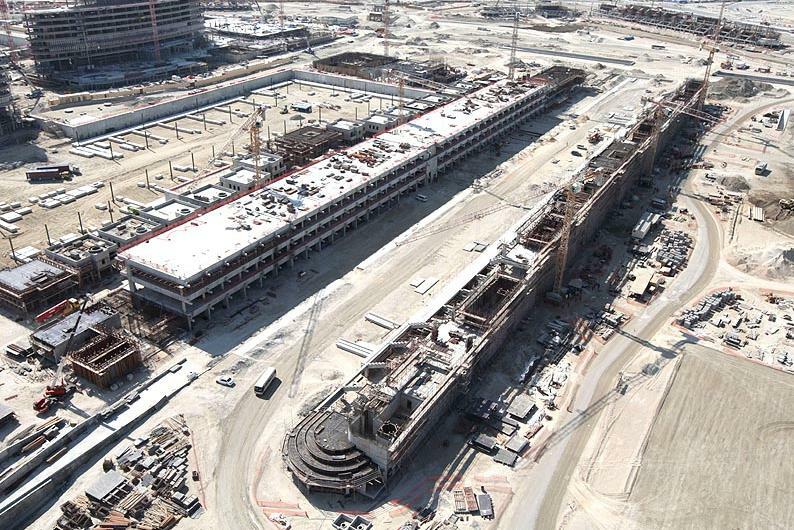 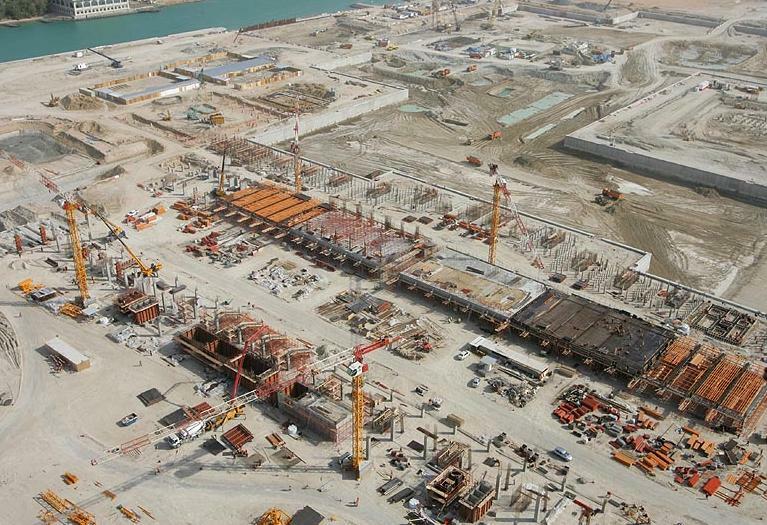 Aldar doesn’t comment on construction costs. 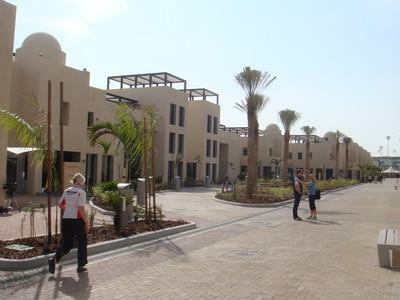 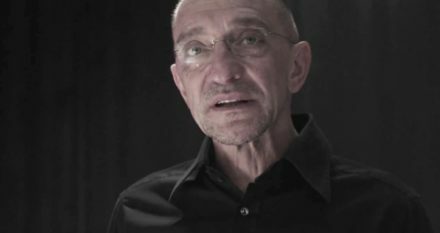 Malik said details of the asset sales will be published in the company’s complete financial results. 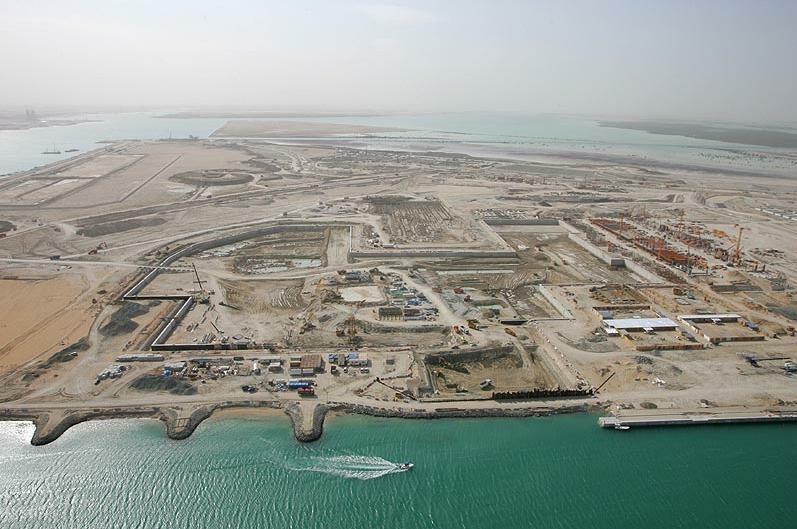 “Aldar’s selling non-core assets was expected as reliance on government support has to be properly managed, and by selling the circuit Aldar frees up some needed liquidity instead of tapping into government pockets,” said Saud Masud, head of research at UBS. 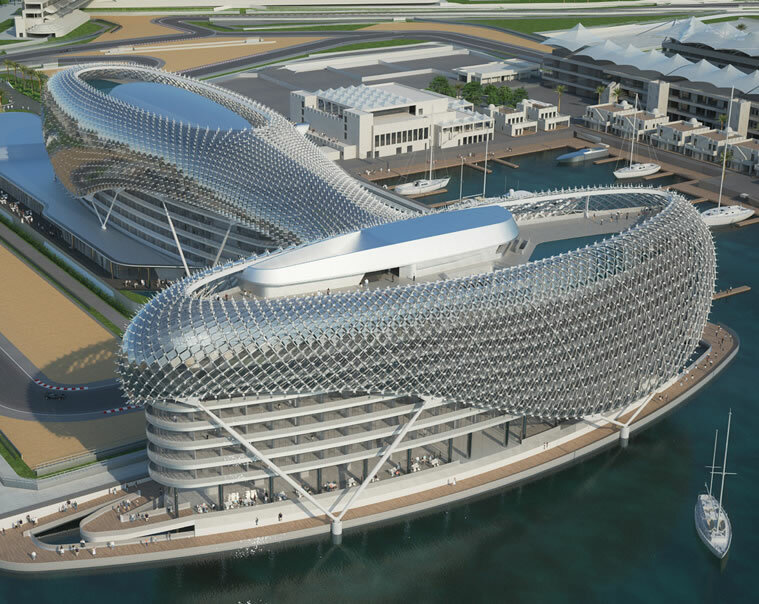 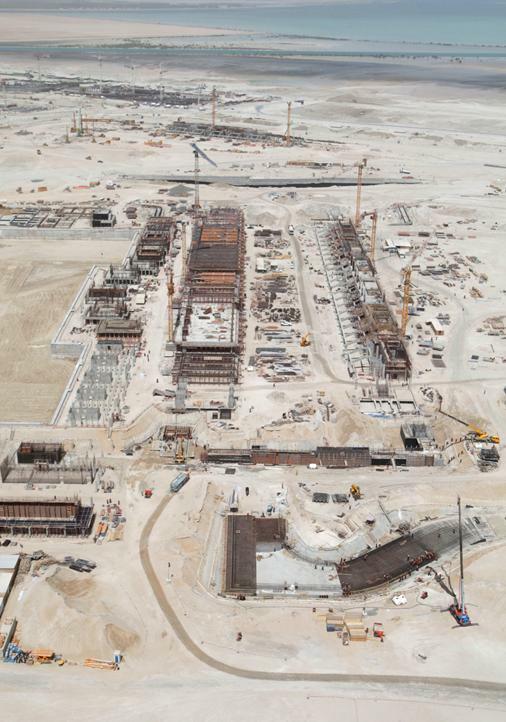 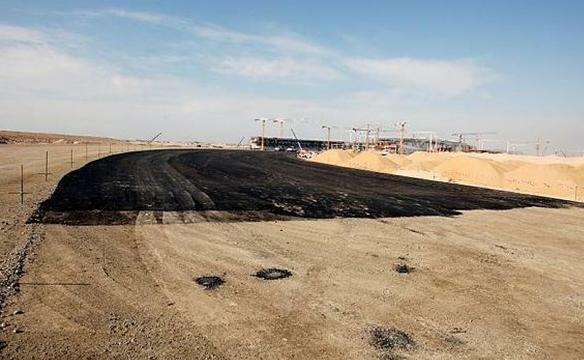 Malik said the sale of infrastructure and property assets on Yas Island, which Aldar has spent at least $600 billion developing, back to the government was strategic and always a possibility. 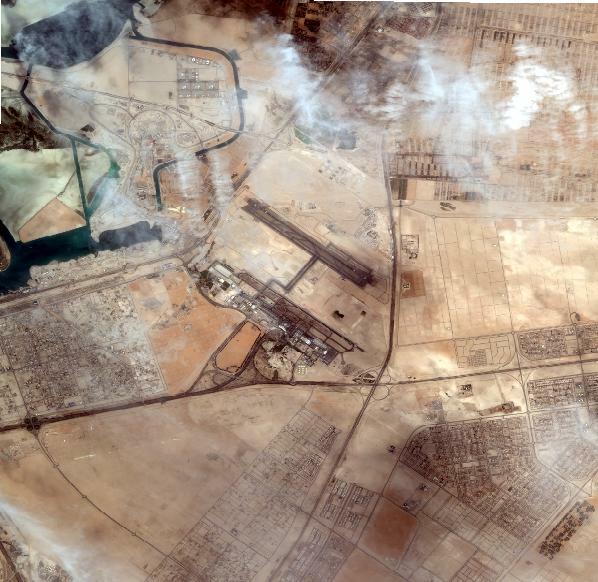 “There was always a plan to have some sort of an arrangement with the government,” he said. 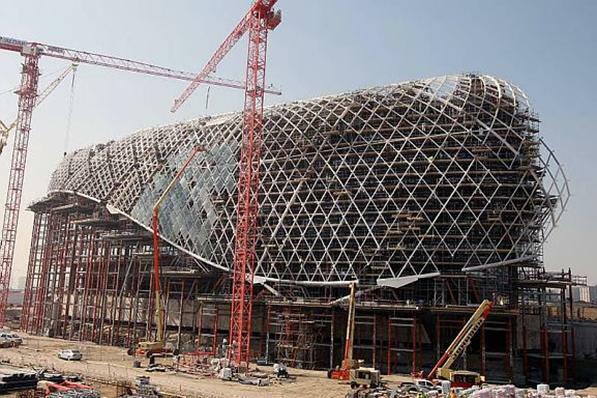 “The whole of infrastructure in Abu Dhabi, and in Yas Island, is part of Abu Dhabi’s broader economic diversification plan – these infrastructure assets are part of that,” he said. 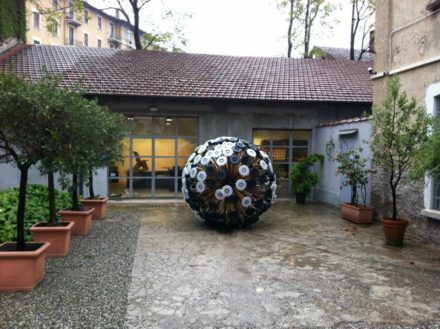 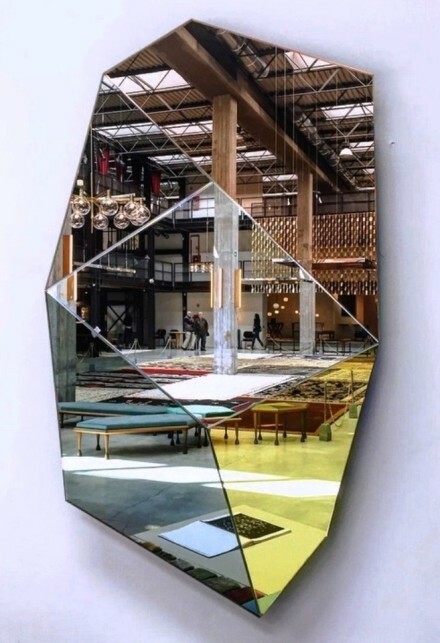 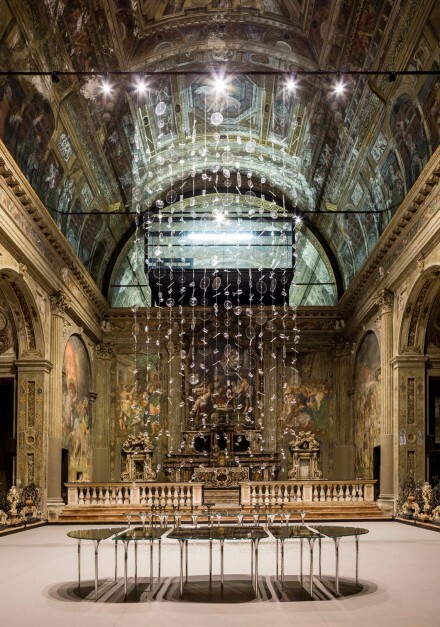 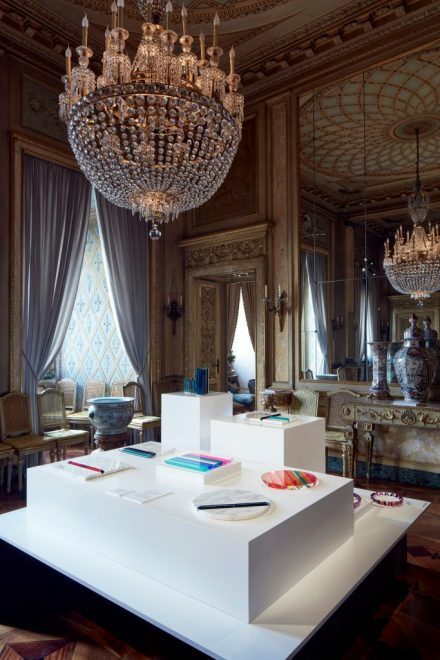 The large space of Nilufar Depot is divided into a series of boxes that represent the work of the most interesting names selected by the Milanese gallery owner Nina Yashar.